This greeting page is now 5 years old and my LJ is very rarely updated anymore with the advent of people moving on to other social media sites. Instead, I have moved the vast majority of my public LJ postings to Tumblr! Just to let everyone know who is not already on my friend's list to comment if you want to be added. I don't check up on who has friended me or not so I have no idea who or who has not has friended this journal. And I'm not going to automatically assume you even want to be added. I friends-lock my WIPs, doodles, rants, general conversation, and pretty much anything I'd consider more personal (without moving into really personal stuff or TMI). It is pretty random and I tend to use my LJ friends as a sounding board when I'm considering something new or just need advice on a project (or on life in general). So just comment here if you're interested. As long as your journal is active and you seem to be a real person (not a suspiciously empty journal with no contact information or apparent life) and you are not someone I personally object to (though I really can't think of any offhand) then I'll add you. Though if I notice you've not friended me/unfriended me before I add you (I check only every few weeks) then I may not reciprocate. Why enable a person see my random stuff if they're not even watching at all? Feel free to AIM me when I'm online, but keep in mind that I probably won't be receptive to 'small talk'. Do not contact me if all you want to say is "Hi. How are you?". I DESPISE that. But if you want to discuss fursuits and fursuit business - then I'll be all over that. I occasionally go through and remove friends who have not friend me back/unfriended me. So if I friend you upon request and then later unfriend you with no explanation, that's a likely reason why. 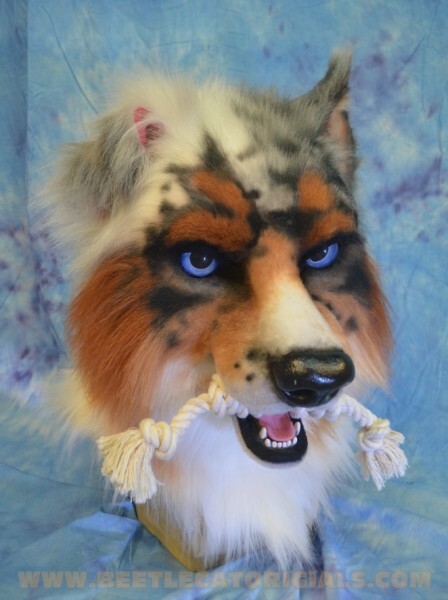 www.crscraft.com (international) – Realistic furs. Ignore the short pile and fun fur as it is not good for anything except small accents. I use a lot of their furs in my suits. www.distinctivefabrics (USA) www.interiormall.com(search for 'promo shag') (Canada) – solid colors of fluffy fur for toonier characters. I use Createx airbrush paints. My airbrush is a Badger 155 Anthem. My compressor is an IWATA Smart Jet. No I can not tell you what airbrush/compressor to buy. The above is what I have and it works for me. Createx (transparent or opaque does not matter) has proven to be one of the longest lasting paints, but you can airbrush with any material that you can get to come out the nozzle. In a pinch I'll use basic artist's acrylics. No you do not NEED an airbrush to paint fursuits. I used a paintbrush and watered down acrylic paints for a long time. An airbrush is extremely useful if you make a lot of costumes, but it is not a requirement. - I do not know anything about, or even particularly like, anime. I have never even MADE an anime fursuit! I do not go to anime conventions. Red XIII and Amaterasu are not anime - they are video game characters (from Final Fantasy and Ōkami​ respectively). My Targ is from Star Trek. - I will not make a copyrighted character. Not just because it's illegal but because it would get very boring very fast making the complete cast of Wolf's Rain over and over again. Assume everything except seen above. I go to FC every year, the rest can vary but rarely venture away from the west coast. Feel free to leave comments/questions, but I will delete the irrelevant/off topic/out-dated to keep this page clean. A long while back I bought a large wolf headbase (with teeth, tongue, and attached resin nose) from DreamVision Creations. The rush order I needed it for ended up falling through so I decided to make this. I've been working on it gradually for months in my spare time. I didn't fuss too much about being super breed specific. 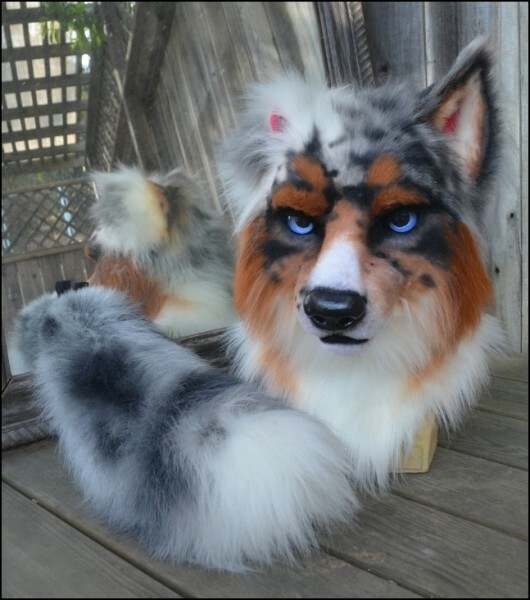 Mostly I just wanted to use up the headbase, airbrush some merle (merleing? ), and try my hand at a flopped ear. The flopped ear turned out to be rather a lot more difficult than I expected due to the curve of the ear base but I think it still looks rather decent and realistic given all the fluff in the way. I backtracked a bit after I had already partially furred the head and used antron fleece for the muzzle just to see what would result. I think this is a technique I will be using more in the future when appropriate as the fleece is so easy to apply and no trimming needed! I used red, white, and grey furs and airbrushed the markings. I didn't really 'plan out' what I was going to be painting so much as I just went at it and then freaked out and cleaned some paint off and let it dry then went at it again then freaked out that I had ruined it when I woke up the next morning and so I reevaluated and worked on it before breakfast (primarily remixing and reairbrushing the red to match better and adjusting markings where seemed appropriate). Then a few days later I gave it a few more touch ups (added some more grey and darkened some of the black). I am having a sale on ears. Only for the next 6 hours! He was made to fit a 5'10, 170lb man snugly so smaller will fit but no larger. His paws will fit a foot up to 10 inches long but new ones could be an option. I would rather not alter the bodysuit any. Django features my first toony eye design and is about a year old now. I gave him the name because, when I was working on him, I was listening to the Film Sack Podcast episode 'Django' where they kept imitating the theme song over and over and so the name stuck in my head :p You are free to change it or keep it. First off, you will need a duct tape dummy for this. I suppose it is possible to do this without one but you will need a close friend/family member who is willing to spend several hours with you, while you are practically naked, and touch you pretty much everywhere. I'll go on the assumption that you have a dummy of some sort, since doing this on your own will not be easy. First step, go buy a pattern. Any will do as long as it is a jumpsuit of some kind (top and bottoms attached). 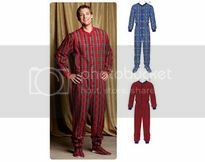 I used a pattern for pajamas, you can also get patterns for actual halloween costumes. Second step is to find the closest approximation to your size, and then sew it up using cheap material such as old bedsheets. Try to use something that does not stretch or your results will not be accurate. I am going to assume you know enough about sewing to do this without guidence, if not, there are other places you can learn how to sew. Jumpsuits are pretty easy though, mostly straight lines and no tricky bits, and we don't care about things like zippers and interfacing at this point and you're just going to cut this apart later. Step three, put your bodysuit on your dummy (or vise versa) and begin pinning it in. Or a stapler works too. Try to resist creating new seams and just pin in the ones already there. Make sure you don't make it so tight that you can't move. I prefer to keep places like under the arms and the crotch fairly loose. After all, this bodysuit is supposed to be comfortable. You can add darts if necessary and you will probably have to if you have breasts and want a tight fit.Now, take it off the dummy, sew it up and remove all the pins. Try it on to make sure it fits well and to do any last adjustments. Now take it apart. I just cut the material right next to the seam. This will leave no seam allowance, but you can add that later. You really only need to keep half of the suit ( especially as you want both sides to match). So pick a right or left and keep the front, back, and arm from that side.Lay them flat and trace them onto stiff paper. If you don't have any and you want to keep these patterns for future suits, then trace them onto newspaper and layer the back with duct tape to stiffen it (and waterproof it too.. will the uses of duct tape never cease..) You can add your seam allowance here, if you want. I prefer to go without and to add it when actually cutting the material. You can also even out your pattern here, making sure all the things that have to match up do. Like the lengths of the back and front leg seam, and the back and front arm seam matching the arm. Basically, everwhere two pieces of material meet. Now that you have a pattern, I want you to go find more scrap material to cut out and sew up into another bodysuit. This may seem like a repition of the first couple steps, but this time you're sewing up your own pattern, and you want to make darn sure it fits before cutting up the expensive stuff. As well, what you just made was a pattern for a basic form-fitting bodysuit. This is where you tailor that pattern towards whatever particular suit you're making. Now, run and sew up another scrap bodysuit using *your* pattern this time. All sewn up? Good. Does it fit? If so, very good! Otherwise, make your alterations and then make them to the patterns you used as well. Now, this is the fun part, take the suit off and put it on your dummy. Then take out a marker and draw on your character's markings. Use a lighter coloured felt first and then, when you're totally satisfied, go over it in thick black marker. Don't forget to label your pieces before you cut them out. If possible, it is best to use straight lines and use the existing seams as much as you can. And don't mess with the crotch and under arms- many seams come together there and it'll just get difficult. Cut the new bodysuit up on the seam lines you drew and the original ones. It may be possible here to minimize the number of seams by not cutting apart some original seams (example, if you have a belly panel, you may not need to use the original seam going down the middle of the belly). Just keep in mind that the more seams there are, the more body-hugging this suit will be and removing seams can make things slightly more complicated to put together and it needs to be measured exactly to prevent lumps (such as at 'T' seam intersections). Unless you plan to use this same pattern in the future, you don't even need to transfer the fabric patterns to paper, just trace straight onto the appropriate fur. Cut out the fur pieces and sew them together (you should be getting pretty good at sewing by now with all this practice). Of course, you need a zipper or other fastener(s) but the instructions that came with your jumpsuit pattern still apply, and just refer back to that if you have troubles.As well, if you are like me, you add more seam allowance than you actually sew, so the suit may fit a bit loose. That is good, gradually take in seams (put the suit on the dummy inside out and mark all the loose seams) until it fits how you want. I prefer to error on the side of caution and piecing material in between seams (to make the suit bigger) is not fun.Then, a last step before adding a tail etc, if you have not already, trim all your seams and then go over them with a zig-zag stitch. Or serge them. You want strong, skinny seams. And there you go, the comfortable, form-fitting bodysuit I promised. 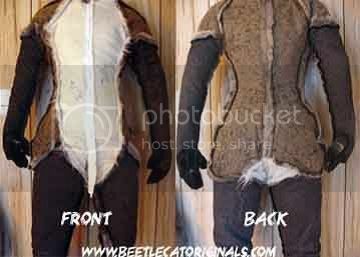 Add paws, a tail, and a head and you have a full costume. For the last resin mask I sculpted, I set my camera up in the corner and let it run for an hour as I worked. This is that video sped up X4. Started this one a few months ago and he's finally finished! There used to be a lot of questions about how to weft loose hair and I was working on a project using it so decided to make a quick video of the process. Or at least of how I personally do it. I've tried sewing them. And I've tried sandwiching them between material, but the simplest (of mucking them up with hot glue) really does seem to be the best.